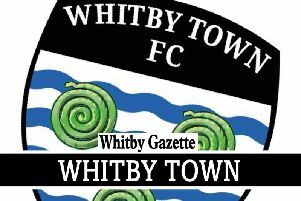 Whitby Town face fellow promotion-chasers Buxton at the Turnbull Ground this Saturday. The Bucks lost one of their two games in hand on Whitby, and their unbeaten home league record, to Stafford Rangers on Tuesday night. Second-placed Buxton are only two points ahead of the Seasiders, who sit fourth after their 3-1 reverse against Stafford, as skipper Greg Young was sent off in the second half. At the same time, Blyth extended their lead, at the top, to six points, with a crushing 4-1 victory at Skelmersdale United. Honours were even last season between Buxton and the Blues. Dale Hopson’s late penalty sent the Seasiders to a 1-0 victory at the Turnbull Ground, before the Bucks’ 3-2 win in the return, despite goals from Mikey Roberts and Callum Martin almost securing a dramatic comeback. Centre-half Andrew May is doubtful and expected to return a week later for the trip to Workington. Kick-off at the Turnbull Ground is 3pm with admission set at £10 for adults, £6 for concessions, £3 Under-18s and Under-16s go free when accompanied by a full-price paying adult.